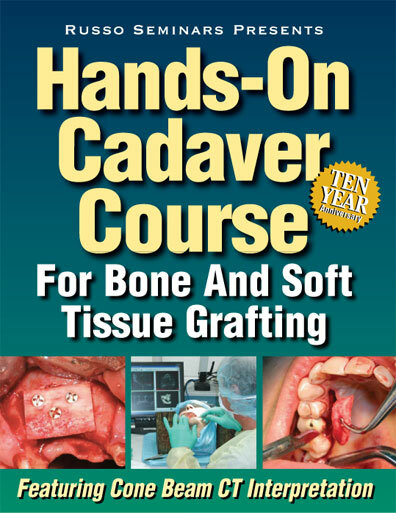 This course is designed to give clinicians the confidence to perform soft tissue grafts, appropriate flap design for full and partial thickness flaps, suturing and advanced bone grafting procedures upon returning to their offices. Our structure is a combination of in-depth lecture, over the shoulder demonstration and a hands-on workshop with models and fresh frozen cadaver heads on advanced bone grafting for implant placement. 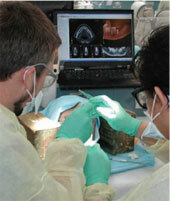 One of the unique features of our course is that we provide cone beam CT scans and Virtual Implant Placement software interpretation of every cadaver head to simulate a realistic learning experience. This is the closest thing to performing live surgery! Each participant will receive a comprehensive manual which compiles PowerPoint slides from the lecture. This makes following the lecture more enjoyable than having to take detailed notes, and provides an excellent reference back in the office after the course. Each participant will also receive a personalized monogrammed scrub which can be worn in the lab, as well as a soft sided attaché. After completing this course the clinician should be able to treatment plan dental implants based on prosthetic classifications, divisions of available bone and classifications of bone density. The surgeon will be able to provide appropriate manipulation and grafting of the soft tissues, and have exposure to the practical use of cone beam software (Virtual Implant Placement). Finally, the implant surgeon will have a more thorough understanding of advanced bone grafting procedures which will ultimately improve implant success, longevity and esthetics for their patients..
Dissection of nerves, muscles, spaces, etc. is a graduate of The Ohio State University College of Dentistry. He completed his periodontal training and earned a Master in Health Sciences degree from the Medical University of South Carolina. Dr. Russo is a Diplomate of the International Congress of Oral Implantologists. He is in private practice in Sarasota, FL and is a clinical assistant professor at the Medical University of South Carolina in the Division of Periodontics. 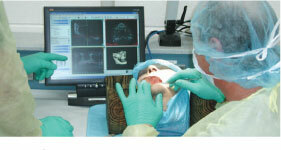 He is an author and an international lecturer on bone grafting and dental implant surgery. joined the Medical University of South Carolina faculty in 1985. He is Professor and Chair of the Department of Stomatology, Director of the Division of Periodontics and a Diplomate of the American Board of Periodontology. He maintains an active practice limited to Periodontics within the College’s Dental Faculty Practice. Dr. Gellin is also the administrator of the College of Dental Medicine’s clinic management software. Dr. Theirry Bacro. Associate Professor, Department of Cell Biology and Anatomy. Dr. John “Eric” Hamrick. Diplomate of the American Board of Periodontology, Clinical Assistant Professor, Division of Periodontics, Department of Stomatology, Medical University of South Carolina, national lecturer on guided bone augmentation, private practice over 20 years in Greenville, South Carolina. Dr. J. Daulton Keith. Clinical Assistant Professor, Division of Periodontics, Department of Stomatology, Medical University of South Carolina. Private practice in Charleston, SC for 35 years limited to Periodontics/implants and international lecturer on bone block grafting and implantology. Dr. P. D. Miller. Clinical Professor, Division of Periodontics, Department of Stomatology, Medical University of South Carolina. Recognized as an international expert in the field of soft tissue grafting, having introduced new concepts and procedures to Periodontics. “One of the best courses I have taken. Due to the number of surgical instruments and cadaver heads needed for the lab, and in order to provide an outstanding faculty to participant ratio, the course must be limited to thirty participants per course. In order to attend the course date of your choice we recommend that you register early. The MUSC College of Dental Medicine is an ADA CERP recognized provider. The MUSC College of Dental Medicine designates this activity for 21 hours of continuing education credits. 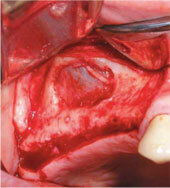 This entry was posted by Dental Continuing Education on January 3, 2011 at 11:13 am under Bone Grafting, Soft Tissue Grafting. You can leave a response, or trackback from your own site. Follow any responses to this entry through the RSS 2.0 feed.